If you are looking for quality general dentistry care, then look no further than Ascent Dental. Our Denver dentist office is conveniently located in the Cherry Creek area and offers the latest technologies and techniques available for giving you quality dental care to prevent and correct dental health problems. We offer these treatments for adults as well as practicing children’s dentistry because we are a family dentistry practice dedicated to forming and maintaining personal relationships with our patients. With proper care, your teeth are designed to last you a lifetime. No matter what dental problems you are facing, we can help you to get the best, most affordable treatments for your procedure. 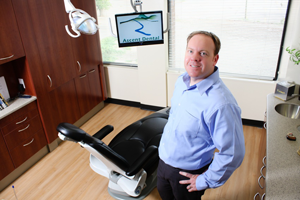 At Ascent Dental, Denver dentist Dr. Jeff Johnston and his team are dedicated to giving you the best dental treatments available. Dr. Jeff has a personal commitment to providing dental care that is not only quality from a medical standpoint, but is pleasant for you and your family. Our compassionate team, our comfortable office, and our dedicated dentist all combine to ensure your dental experience is one of a kind. And we work to make this dental experience affordable to everyone. First, we strive to keep costs down with an efficient practice. We are in-network for most local dental plans, and for those without insurance or for procedures not covered, we offer dental financing. Our office is conveniently located in Cherry Creek, easily accessible from most of the Denver metro area. We invite you to join our dental family today: please schedule a consultation with Dr. Jeff Johnston.